Home > Living > Solar > Vivint Solar Reviews: Taking Over the Home Solar Market? Are you committed to having a green home? Have you considered going solar? The residential solar industry is booming, and homeowners have more options than ever before. Vivint is one of the largest providers of residential solar panel systems in the U.S., just behind SolarCity. Vivint Solar launched in 2011, and the company continues a path of rapid growth into more and more states. They’re a worthy competitor in the solar industry, but what does Vivint Solar deliver to homeowners? Enough that we ranked them third in our Residential Solar Panel reviews. But we encourage you to read our Vivint Solar reviews to see if they’re a good fit for you. Vivint Solar cost varies widely depending on your home rooftop design, your market and which type of financing or plan you obtain. Tip: Apply for state and federal solar energy tax incentives and rebates to save even more money. Purchase or obtain a loan. Vivint Solar offers loans or the option of paying outright. They provide a 20-year system warranty. Lease a solar panel system with $0 down and a fixed monthly lease payment. Power Purchase Agreement. A PPA is similar to a lease in many, however, rather than paying a fixed monthly lease fee, with a PPA, you pay monthly for the electricity you produce at a set rate. Vivint Solar offers $0 down and a 2.9% annual escalator. VivintSolar occasionally has promotions, find them and discuss on our dedicated VivintSolar coupon page. What’s the Buzz About Vivint Solar? See below for a balanced sampling of positive customer reviews and Vivint Solar complaints from customers who currently use their solar panel systems. Does Vivint Service Your Area? As we stated above, Vivint Solar is now available in 14 states, including AZ, CA, CT, FL, HI, MA, MD, NJ, NM, NY, PA, SC, TX and UT, as well as the District of Columbia. In 2016, Vivint Solar branched into seven new states and continues its rapid growth. Check out a local news report on the arrival of Vivint Solar in New Mexico. What’s Our Final Verdict on Vivint Solar? Vivint Solar’s growth has exploded in the last couple of years. And some say that rapid expansion is to the detriment of their company’s installation time and customer service. While they appear to be working on upping their company’s infrastructure, Vivint Solar still has a way to go to becoming the best in the industry. With that said, Vivint Solar is still a powerhouse in the industry and certainly worth consideration. For as many disgruntled customer reviews we’ve seen, there are many more satisfied customers. One of Vivint Solar’s main selling points is the ability to sync your solar panels with Vivint’s wide variety of smart home security and automation products. If you already have Vivint Smart Home products or you’ve been pondering turning your house into a smart home, give their solar panel system serious consideration. 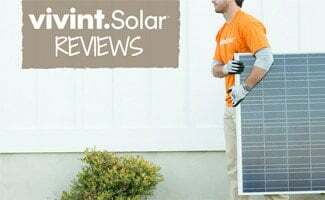 But before you decide, be sure to check out Vivint Solar’s competitors in our reviews of the top solar panel systems for your home. What do you like or dislike about Vivint Solar? Vivint Solar is a rip off so please please please look elsewhere if you want to go green. I’m still waiting a year after install for my system to be turned on. I have Vivint for my home alarm system so was so excited to see they offer solar systems too because I’ve been so happy with their service and products. I don’t know if I’m quite ready yet to make the investment into this but when I do will definitely check them out for sure!